The Archangel Program provides opportunities for success to students who encountered academic difficulties during elementary and middle school. Through small class sizes, frequent student-teacher interaction, close cooperation between home and school, and the student’s commitment to success, the Archangel student will proceed through a college preparatory program. Archangel students are integrated into other class levels based upon academic achievement in their junior year. To enhance the learning experience and make lessons more interactive, students utilize the most state-of-the-art technology including iPads with various educational applications. Any prospective student who has an IEP, 504 plan, or psychological educational evaluation should enclose it with the Application for Admission. Each student must take the High School Placement Test. Once accepted, the Woodcock-Johnson III will be administered in the fall of the freshman year and the spring of the sophomore year. In addition, incoming Archangel freshmen complete a one-week summer program prior to Grade 9. 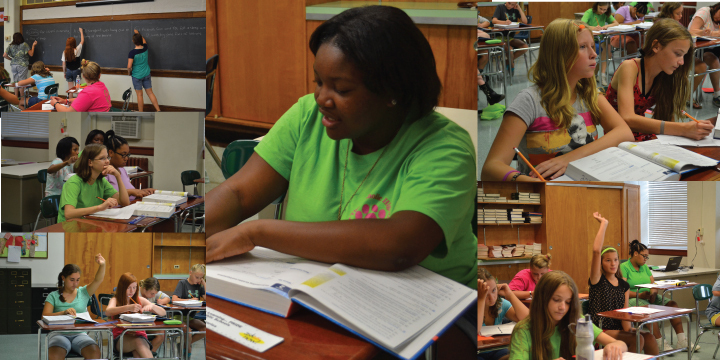 The summer program includes two hours a day for Pre-Algebra and two hours a day for Reading/English/Study Skills. Attendance in each session is based on academic need. If you are unsure whether the Archangel Program would benefit your daughter, please contact the Office of Enrollment at 410.732.6200 ext. 216 to schedule an appointment. There is no late acceptance without testing and approval of the Coordinator of the Archangel Program. There is an additional $1,500 cost for full Archangel students (Math and English), and a $1,000 for partial Archangel students (either Math or English). The Archangel Program also provides guidance and assistance to Archangel students through a class called Academic Cognitive Enrichment. This course focuses on study skills, organizational skills, and test-taking skills. In addition, it helps the student develop an at-home study schedule/routine. The A.C.E class is a mandatory part of the Archangel curriculum.